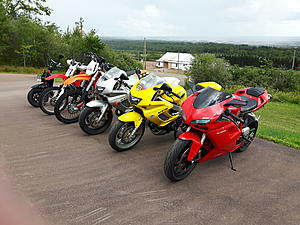 yesterday i took all my bikes out for a short run to get their blood flowing. i do this every so often because a couple of them sit around a lot. my yellow vtr with superbike bars and buell drop pegs is by far my favorite street bike. my 1098 has a large performance advantage but it doesn't touch the vtr for user friendliness and comfort. i guess this middle aged man's age is catching up to him. 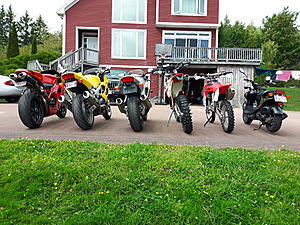 as for an overall favorite the dirt bikes share the lead. that's what happens when you are fortunate enough to ride with your 13 year old son. Keeping the Duc low miles? 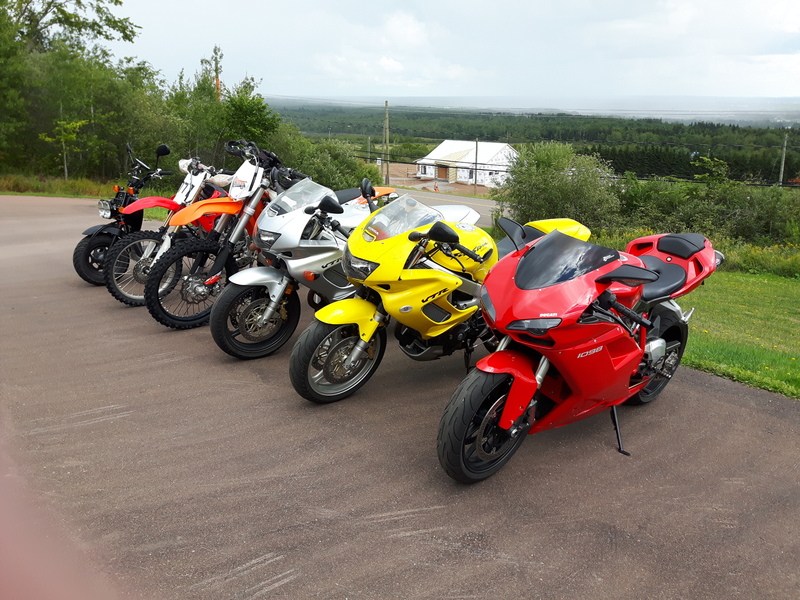 the hawk is just so user friendly and comfortable, not so much my silver one, but the yellow one is with it's buell drop pegs and higher handle bars. that being said i still prob only put 1,000kms on it this summer. street riding has taken a back seat to dirt riding. it's pretty hard to top a beautiful summer day out on the trails in the woods with my son. I find the same attitude toward my Multistrada. It's so much more comfortable than the Hawk, has tons more power, suspension is light years ahead, etc. There is only one area that the VTR wins and that's my foot situation. It's not position per say, but I'm so used to riding on the toes when the pace quickens and I'm not comfortable doing it on the MTS. 1098's are beautiful machines. I'd keep it too. Maybe track it a few times? I can understand the 1098 after an affair with an 848 . Great bike but uncomfortable compared to the VTR. 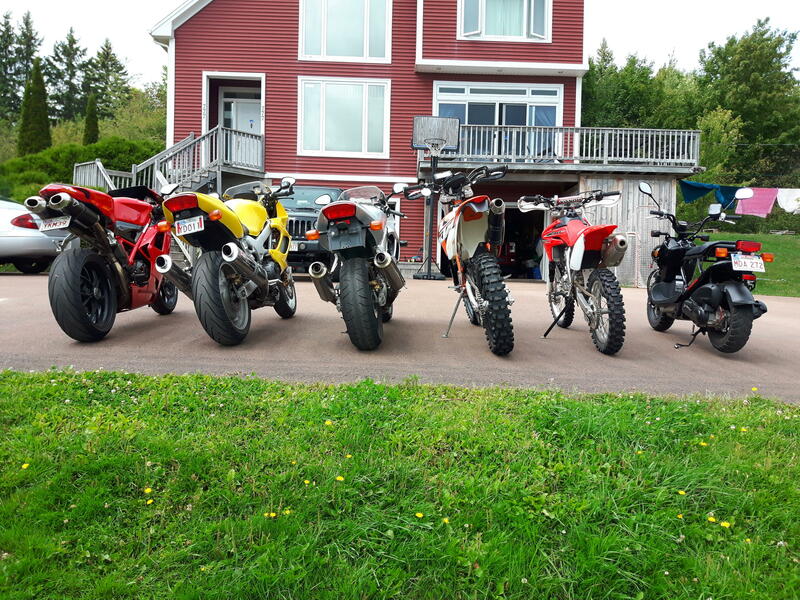 I don't think dirt bike vs vtr is a fair comparison. Very apples and oranges. Both bikes I guess but totally different purpose. That is a fine stable of steeds though. D&D street pack vs race pack?